The versatile BRC-X400 PTZ camera is ideal for use in a wide range of environments - from broadcast studios and remote on-air suites to sports stadiums, arenas, houses of worship and lecture halls. The camera's 1/2.5-type Exmor R CMOS sensor captures broadcast quality 4K images with excellent sensitivity, very low noise and rich, natural colour reproduction. 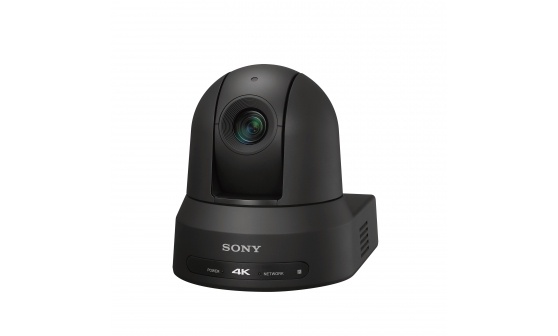 It's complemented by the integrated high-resolution lens that offers a powerful zoom capability up to 80x in Full HD (30x in 4K), with an expansive 70 degree wide angle coverage to capture every point of view. Efficient IP-based live production is augmented with support for NDI®|HX* (via optional license), allowing flexible configuration with other networked NDI-enabled devices. Images also can be reviewing remotely via a web browser, with support for RTSP (Real Time Streaming Protocol) and RTMP** (Real Time Messaging Protocol) ensuring smooth, stable streaming of video plus audio (from an optional microphone, available separately) over an IP network. Installation and set-up is easy, with a new Scene File function allowing the same settings to be applied to multiple cameras. Convenient integration in multi-camera live events is also simplified with genlock support and an 'on-air' tally lamp. The sensitive 1/2.5-type Exmor R sensor captures high-quality 4K images with very low noise, even in dimly-lit environments. Powerful zoom up to 80x (in FHD) allows frame-filling close-ups with fine details seen clearly. Responsive autofocus ensures that images stay clear and sharp, even at high zoom settings. Cover the whole scene in sports arenas and lecture theatres with a horizontal viewing angle of approx. 70 degrees. NDI®|HX compatibility (via optional license) supports efficient IP-based live production, allowing flexible configuration with other networked NDI-enabled devices. PTZ and other camera functions can be controlled remotely via S700PTP, CGI and VISCA protocols. View pictures remotely over the Internet from a web browser, with support for RTSP (Real Time Streaming Protocol) and RTMP* (Real Time Messaging Protocol). A single IP cable carries camera power, video image output and control signals to simplify installation and reduce cabling costs. Genlock allows seamless multi-camera switching in live events. The camera's inbuilt tally lamp is ideal for live productions and reality shows. The new Scene File function can apply the same camera settings among multiple cameras for fast set-up. 1700 TV line (4K) , 1100 TV line (FHD).